Sweet Western Romances - Happy Endings Guaranteed! Born and raised in a small coastal town in the south I realized at a young age that I was more adventurous than my conservative friends and family. I loved to travel. My passion for travel opened up a whole new world and new cultures to me that I will always be grateful for. I was raised to treasure family. I always knew that at some point in my life I would leave my story book life and become someone's mother, someone's aunt and hopefully someone's grandmother. Little did I know that the birth of my son at a later stage in life would make me the happiest I’ve ever been. He will always be my biggest achievement. The desire to be a work-from-home mom is what lead me down this path of publishing books. While I have always loved reading I never realized how much I would love writing until I started. I feel like each one of my books have been influenced by someone or something I’ve experienced in my life. To be able to share this gift has become a dream come true. I hope you enjoy reading them as much as I have enjoyed creating them! PS: I'm really Eveline Hart writing under the Natalie Dean pen name. I started her so I could get a feel for what you like and so I could learn the ropes of being a self-publisher. So who did I write that author bio about??? I wrote it in honor of my Auntie who helps me edit all of my books! So it's really about her. If you like Natalie Dean's books, follow her on Amazon to be notified of her new releases. Read more: Sweet Western Romances - Happy Endings Guaranteed! Start this Fun, Charming, Touching Western Romance Series for FREE! Jill Haymaker has always had a passion for writing. 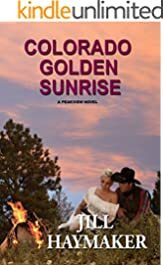 Colorado Sunset was her first full length romance novel. It is the first in a series of novels centered in the small town of Peakview, Colorado. There are currently ten books in the Peakview series and she is working on the final book. ABOUT THE SERIES: Peakview, Colorado is a tiny town nestled high in the beautiful Colorado Rockies. Although Peakview is a fictional place, it is based on a compilation of many small towns in Colorado. With a population of somewhere between one and two hundred hardy residents, these neighbors truly are like family. There’s nothing they won’t do to help or protect each other. At an elevation of over 9000 feet, the air is clear, summer is short, and snow can fall at any time of year. Peakview provides a perfect backdrop for falling in love in front of a warm fire. If any help is needed in finding true love, the town has its favorite resident, Violet Crandall, café owner and a self-appointed matchmaker who will know your exact right person, even before you do. Trust me, she hasn’t failed us yet. So come meet the residents of Peakview, you may never want to go home. Can empty nesters find a second chance at love in the mountains of Colorado? After June Meyers' devastating divorce six years ago, she remained devoted to her children and their home in Ohio. Now her youngest child is off to college, and June faces her future with a mix of anxiety and excitement. 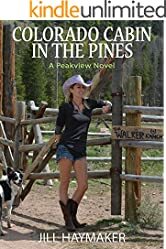 The Walker Horse Ranch in isolated Peakview, Colorado, provides the perfect setting for Jeff Walker to hide from the pain of losing his wife to cancer eight years ago. He's raised his sons and now his ranch and horses are his life. It's just simpler that way. Avoiding making any long tern decisions about her life, June embarks on a cross country road trip to visit her son and grandchildren in California. 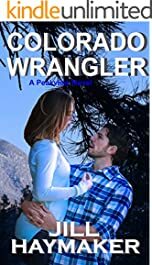 After car trouble strands her in the beautiful Rocky Mountains, she lands at the Walker Ranch, where she encounters the handsome, rugged rancher, Jeff. While neither is looking for a relationship, they can't deny the chemistry that draws them together. Can they drop their barriers and take a second chance at love? Its never too late to find love. Baby boomers will love this book about finding love even after you given up. The first in a series about the wonderful residents of a small Colorado town. You will fall in love with Peakview Colorado and look forward to returning soon to find out who is next to find their perfect match. 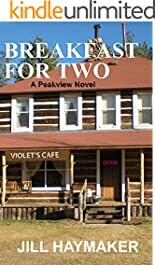 The tiny, mountain town of Peakview, Colorado, wouldn't be the same without Violet's Café, and its owner, Violet Woods. Widowed in her fifties, she leads a solitary life with only her cat Lucky to keep her warm at night. All thoughts of romance died with Stan. They had a wonderful, long happy marriage, and she's content to live out the rest of her life with her memories. Howard Crandall, Peakview's only mechanic, is a confirmed bachelor and something of a hermit. When Stan died, he took it upon himself to look out for Violet. Over the years, they have become friends, but it isn't until the past he has hid from for thirty year past suddenly catches up with him, that he opens up to the idea of finding love. 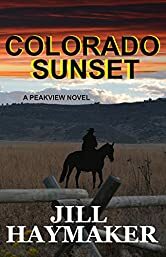 Author, Jill Haymaker brings you back to Peakview, Colorado, in this third in her series or western romances set in the small, fictional town of Peakview, high in the central mountains of Colorado. You'll fall in love with the residents of this close-knit community. Luke Walker loves his childhood home on the Walker Horse Ranch. Now he is building his own cabin on a hillside overlooking the entire spread. He's avoided romance ever since his high school girlfriend left four years ago, taking his heart with her. Penny Anderson couldn't wait to get out of isolated Peakview, Colorado where she was born and raised. At college in Chicago, she found her true passion in working with underprivileged children. When Penny returns home for the summer after graduation, sparks fly between these two former lovers. While Luke struggles to overcome his fear that she will leave again, Penny tries to find a way to have the man she never stopped loving and a career that fulfills her. Come home to Peakview, Colorado where everyone has the chance at love in this silver fox romance. 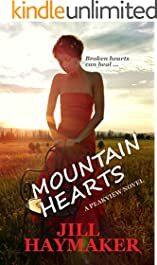 Author, Jill Haymaker, brings you back to the small mountain town in this fourth book in her Peakview Series. Melanie Gentry came to Peakview to find a father she never knew, and found a home for herself and her teenage daughter. Hank Dalton left his past behind and settled into his life as the head wrangler at Peaktop Guest Ranch. He's a loner and he likes it that way. That is until he runs into Melanie who makes him want to reconsider that decision. There's just something special about her. When Melanie adds a foster child and a rescue dog to her family, Hank decides he isn't what she needs. Both must let go of their past mistakes before these two lonely people can find their way to blend their lives and become a real family. 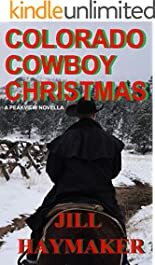 This Holiday season author, Jill Haymaker, brings you home to the small Colorado mountain town of Peakview, Colorado, where everyone has the chance of love. Cynthia Welch has made a name for herself as one of Chicago's top divorce attorneys at the expense of her personal life. Burnt out, she heads to Peaktop Guest Ranch for a couple of months of solitude over the holidays. If you love small town romance in the tradition of Jill Shalvis and Robyn Carr, you're sure to love this small mountain town and it's tight-knit residents. If you love the Silver Fox heroes of Roxanne St. Claire, you'll love AJ Coulter. Discover the true meaning of Christmas and Love in this wonderful holiday romance. Author, Jill Haymaker, brings you back to picturesque Peakview, Colorado in this small town western romance. Sam Phillips has given up on love since the death of his wife. With only his small dog, Marshall, for company, he's content to live out his life alone. That is until he meets the perky and vivacious, Vickie Dalton at her son's wedding. There's just something about her that makes him want to reopen his closed heart. Vickie, widowed at a young age, has spent her life raising her children and grandchildren in Tumbleweed, Wyoming. Romance for herself is the farthest thing from her mind when she travels to Colorado for the wedding. But when she looks into those bright blue eyes, she senses that Sam in one of a kind. Is she too old to take a chance on love, especially if it means leaving her home and grandchildren behind? Under the glow of a Colorado winter moon, can these two lonely people discover a passion they thought was long gone. Can they find a way to juggle family and location to be together? Come home to Peakview, Colorado where everyone has a chance at love. 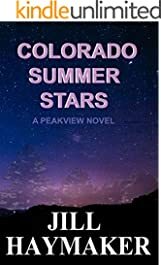 Jill Haymaker brings you home to Peakview, Colorado where everyone has a chance at love. How did her relationship go so wrong? When NICOLE PHILLIPS flees San Francisco after her boyfriend's jealousy turns violent, she doesn't know where to go next. Out of a job and a place to live, she heads to the only place she feels safe--her childhood home in the tiny town of Peakview, nestled high in the Colorado Rockies. The one place she'd sworn to never live again. RICK BRADY was a skinny, nerdy kid, earning him the not-so-flattering nickname of Scarecrow in high school. He'd been glad to escape his reputation and leave Peakview behind. When his parents' health begins to fail, he returns to Peakview and opens his own veterinarian practice on their ranch. He's never really been in love, unless you count that crush he had on the most popular girl in school from kindergarten through senior year. Now fifteen years after they both left town, they are back home and searching for answers to questions they can't define. Beneath the beauty of the Colorado summer stars, they reconnect. They soon discover that it's not easy to leave the past behind. To move forward and find true love, they must overcome their insecurities and doubts and learn to trust again. Forty-six year old, Jake Midnight, is Peakview County's most beloved EMT. He's the best at what he does--professionally, that is. After a failed marriage, which ended over twenty years ago, he's put his personal life on hold. He's content to live alone. That is if you don't count his three horses, two dogs, five cats, and two pigmy goats. When the unfamiliar high altitude of the Colorado Rockies causes Ethan to have an asthma attack, Jake is quick to jump to the conclusion that Kelly is an irresponsible parent. Kelly is furious at the arrogance of this man who know nothing about her or her son. Sparks fly, but there's no denying the underlying attraction that sizzles between them. The warmth of the holiday season has been known to melt hearts, even one's which have been closed for years. 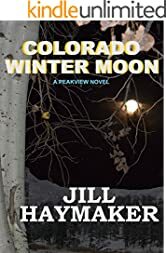 Author Jill Haymaker brings you home to Peakview, Colorado in this ninth book in her Peakview Series. SUZY QUINLAN'S heart dies the day she buries her five year old son, Mason. Leaving the cold cemetery, she flees to the Colorado Mountains searching for peace. Unexpectedly caught in a blinding snowstorm, she seeks shelter in the tiny town of Peakview. JERRY DECKER is known as the town's hermit. Since returning from his service in Iraq eight years earlier, he lives a solitary life hiding from his demons, with only his dog, Bear, as company. Two hearts damaged by grief drawn together as kindred souls. To move forward, they'll have to face their pasts and lay their ghosts to rest. Can broken hearts dare to hope again? COME HOME TO PEAKVIEW, COLORADO, WHERE EVERYONE HAS A CHANCE AT LOVE. Get Started on the Long Valley Romances for FREE! 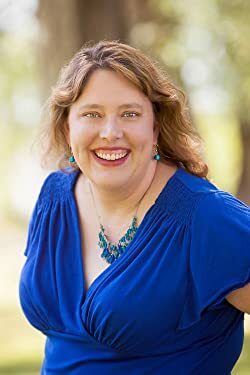 Erin Wright has worked every job under the sun, including library director, barista, teacher, website designer, and ranch hand helping brand cattle, before settling into the career she’s always dreamed about: Author. She still loves coffee, doesn’t love the smell of cow flesh burning, and is quite happily ensconced with her handsome hubby in a small, charming town in rural Idaho. On her site, http://erinwright.net, you can sign up for her newsletter, along with finding the requisite pictures of Jasmine, her kitty cat muse and snuggle buddy extraordinaire. GET A FREE NOVELLA Stampede of Love for joining Erin's Newsletter! Read more: Get Started on the Long Valley Romances for FREE! A Wild Ride with the Banished Love Clean Western Romance Series! Ramona Flightner is an avid reader, writer, and traveler. By day, she practices the healing arts as a nurse practitioner. Every other moment, she's researching, reading and writing her next novel. Ramona is from Missoula, Montana. Her favorite pastimes are fly fishing the cool, clear streams of a Montana river, hiking in the mountains, and spending time with family and friends. Join my newsletter and receive a copy of both Banished Love and the prequel Love's First Flames! Read more: A Wild Ride with the Banished Love Clean Western Romance Series! Meet the Sisters Responsible for the High Country Mystery Series! 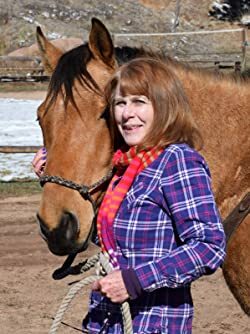 Sisters Vickie Britton & Loretta Jackson, are co-authors of over forty novels including the Jeff McQuede High Country Mystery series: Murder in Black and White, Whispers of the Stones, and Stealer of Horses. They are also authors of the eight book archaeological Ardis Cole Mystery Series and the Pre-Columbian mystery series. A High Country Mystery Series has SEVEN books for you explore, with an eighth, Rapid River Hoax, releasing this fall! Read more: Meet the Sisters Responsible for the High Country Mystery Series! Meet Ciana Stone and the Honky Tonk Angels Romance Series!